Things are moving quickly around here. My phone is buzzing with realtors and banks. Everyone is looking for our business, eager to show us around town at the houses available. A flight has been scheduled. In two weeks my husband will be setting his feet in our new town and in our new home. I am sure that one of the houses he looks at will become our home for the next phase of our lives. I am excited. My desk is flooded with printed prospects from zillow.com. It is amazing how house hunting can be done on the internet weeding out the frogs and providing a more effective hunt. I trust him to make the final decision because I know that he will keep me in mind. He thinks I’m picky, which I can be, we just value different features. Combining my main feature requirements and his will make a nice pick I am sure. My requirements are more of a mom view. A yard to run around in, big enough for a future garden and swing set. A giant porch for grilling and outdoor eating and drinking with future friends. A house with enough storage, a moderately updated kitchen and maybe a space for my crafting station. Currently in this house my crafts are in the garage with a lawn mower, punching bag and small bikes restricting my access to it. We do not have the space in this rented house, but renting in this area is extremely overpriced. All in all I just want us to enjoy our house, neighborhood, town and schools. I can’t wait to use the word “home” to describe a place I live! I am still sipping on my homemade infused water. I made another, much larger batch, and drink it in the morning while I wait for my medication to allow me to eat. I have learned that it is an excellent hangover cure. Last night we went through 2 bottles of Sangria while watching a movie. I highly recommend renting ’71. I have not drank in a long time and found that drinking left me with a headache despite the 3 liters of water I drink daily. One glass of this infused water took it right away. Maybe it is a coincidence that it did, but I will allow it! My diet has become frustrating. I am still using and enjoying MyFitnessPal and my scale says that I am making progress, but I cannot see the progress. Perhaps it is because I see myself everyday? Although, my clothes are not hanging any differently. I’m not sure where the weight is dropping from, but I am convinced it is my toes. Yes, 11 pounds down. My feet must have been huge. It is also possible that weight lifting and exercise is altering fat storage areas for muscle and that is why I do not see the big difference in my clothing. I will keep at it. I am knocking at the door of my goal with lots of toning and muscles building ahead. 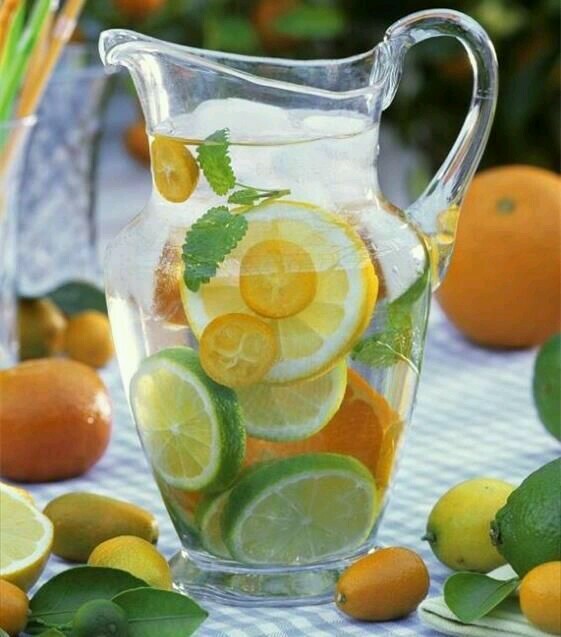 Lemon, Lime, Oranges and Mint.